The New Jersey legislature is finalizing a bill that will go to Governor Christie that raises the state’s minimum wage to $8.50 per hour. The current rate is $7.50 per hour. 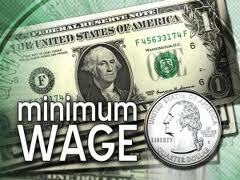 The legislation also link the minimum wage to annual adjustments based on the consumer price index. If adopted under the new legislature it would mean a $50 per week raise for someone working 40 hours. For a small business with 5 employees making minimum wage it would mean a $250.00 weekly increase to the payrolls and for one month that would mean a $1,000.000 increase. The NFIB strongly opposes the legislation, citing that it would lead to increased operating costs for New Jersey small businesses. “Operating cost increases could also be projected onto consumers, further raising the fees for goods and services in New Jersey.” They are encouraging members to contact their legislature by visiting the New Jersey legislature webisite. Final voting on the measure is expected to take place on 17 December 2012. Governor Christie have not announced whether or not he would approve or veto the measure. If approved it would be a 17 percent increase and it would make New Jersey the state with the highest minimum wage on the east coast. © 2012-2015 The Small Business Zone, Inc. All rights reserved.